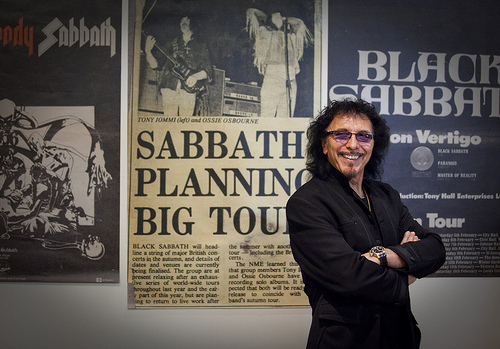 Via those industrious chaps at Metal Hammer magazine, we learn that legendary Black Sabbath axe-smith Tony Iommi is NOT planning to reunite the classic Sabbath line-up of Ozzy, Geezer, Bill and himself. At least, not imminently. Chalk that rumour up to an over-zealous local news hack running wild with a casual Iommi aside and then seeing it become a global news story in moments. No classic Sabbath world tour is forthcoming: Put your credit card down, back away from your ticket provider of choice, nothing to see here. What Iommi is doing is publishing his autobiography in Europe on 13th October, and in the US on 1st November and his website official website notes that Tony plans a signing tour to coincide with the book’s European publication. No dates yet but I’m putting in my request for Sheffield here – it would coincide nicely with this city’s annual book festival, Off The Shelf.